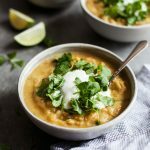 This curried butternut, red lentil, and apple soup is the happy merger of a number of my favorite soup flavors: squash, apples, onions, curry. It’s surprisingly complex for a soup that features only a few main ingredients and is really easy to prepare. Best of all, it’s one of those soups that can be either pureed into something that’s sort of like a bisque or left chunky and more like a stew. It comes together quickly–about 25-30 minutes, tops–and you can use it as a base for adding leafy greens or other extra vegetables if you’re so inclined. The soup is a little more than that. It’s my small attempt to evoke comfort and sustenance in a season and time when these things feel distant to many of us. On Sunday, in my weekend reading post, I mentioned that the change of seasons often reflects or enhances or compliments change and upheaval within. Transition can be dizzying, just as it can be liberating. It’s natural for anxiety to come up as we ready ourselves for winter, a response to darkness and short days and the impending quiet of turning inward. It’s also November, which means that holidays are coming, and with them all of the commotion and mixed feelings that they can create. The winter holidays were dear to me growing up, and I remember feeling mystified that anyone might greet them with anything short of glee. I understand now how complex they can be, how draining, no matter how much goodwill is at large. And in the midst of it all, a great many people woke up today feeling confused, saddened, angry, or fearful. I have little wisdom to offer here: I’m no more sure of how to contextualize bewilderment or unrest than anyone else. What I do know is that when I’m feeling overwhelmed or baffled, I often look to food as an anchor. I can’t sift through how I feel about the big things, but I can piece together a meal. I can combine a few ingredients, and much to my amazement they will become something that is nourishing and sustaining. It’s not everything, but it is something, and it matters. So, on this very gray November morning, in the midst of change and transition that may be far from easy, I offer you soup that is sweet, savory, and hearty. I hope it will warm you up, and maybe lift you up. Heat the olive oil in a large soup pot over medium heat. Add the onion and celery. Cook, stirring occasionally, for 5 minutes, or until the onion is soft and clear. Add the broth, curry, salt, pepper, red lentils, squash, and apples to the pot. Bring mixture to a boil. Reduce heat to low, cover, and simmer for 25-30 minutes, or until the lentils have melted into the soup and the squash and apples are very tender. Stir once or twice during cooking. When the soup is ready, you can puree it partially or completely with an immersion blender (or not). Taste the soup and adjust seasoning if desired. If you'd like to enhance the soup's sweet notes from the apple, stir in 2-3 teaspoons maple syrup. Serve. Leftover soup will keep for up to five days in an airtight container in the fridge. It can be frozen for up to 1 month. As I mentioned, it’s easy to wilt some leafy greens into this soup if you’d like to add even more nutrient density (and a little calcium). And if you don’t have butternuts squash, acorn squash or sweet potatoes will be great, too. 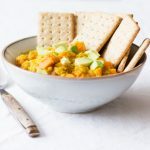 I recommend serving it with a hunk of whole grain bread, at which point you’ll have a pretty complete and satisfying meal, with plenty of leftovers to look forward to — unless you bring this soup to a holiday gathering, which isn’t a bad idea at all. Speaking of holidays, many of us have a lot of cooking and entertaining ahead. In anticipation of that, I’m enjoying the opportunity to sit down and help myself to something simple and wholesome. Next week, I’ll be sharing some slightly-more-elaborate and festive recipes for your holiday table, recipes that will hopefully give pleasure to everyone you’re gathering with. I have such a big obsession with red lentils! They sure make for a magic creamy soup base! You have a knack for seeing what I’ve just bought and putting it all together in a way I would not have considered! This looks perfect. And I’m all excited about baking whole grain bread these days. Thank you Gena. So happy you like the soup. I’m really keen on dipping my toes into the world of homemade bread, so if you have an easy recipe — something that won’t deter a novice — I’d love to hear about it! Dear Gena, thank you for showing – yet again – that you are not “just” a food blogger but also feed the minds and souls of those reading with your calm and comforting words . To me, those things matter and I’m sure to others as well. I love all your postings/recipes… but this well-timed, comforting entry was just what my soul and tummy needed. Thank you. 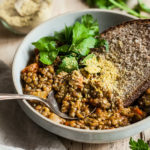 I will definitely try it – always looking for new recipes involving lentils and butternut, as they are my favourite products 🙂 Thank you for sharing! This looks like just the sort of comfort food I could use now. Thanks! Not only delicious but superb colorful also this red lentils and apple soup! I am impressed about this soup & I`d like to try it soon, sounds so good. Awesome! This could be really nice for me, nice recipe! Making this tomorrow! Just curious what kind of apples you used? I used gala, but I think a wide variety would work! I love to try this out. Looks so comforting and delicious. I think this is perfect for a stressed and a long day. Thanks for sharing this recipe! Hi Gena ! Your soup is so so tasty ! Thank you very much for sharing your recipe. I think it’s the best soup I had this winter so far ! Oh I have to try this. 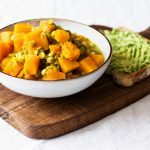 I love butternut squash and with lentils and apples, what a lovely mix. And curried too 🙂 I love making homemade soups, winter and summer. Can’t wait to buy the ingredients to try this. Will be lovely with this wholewheat bread topped with seeds that my local bakery here in Vienna makes. Thanks!